Sensei Alex Lloyd, Hanshi Howard Lipman & Sempai Jasper Choi, at a training session after the grading. 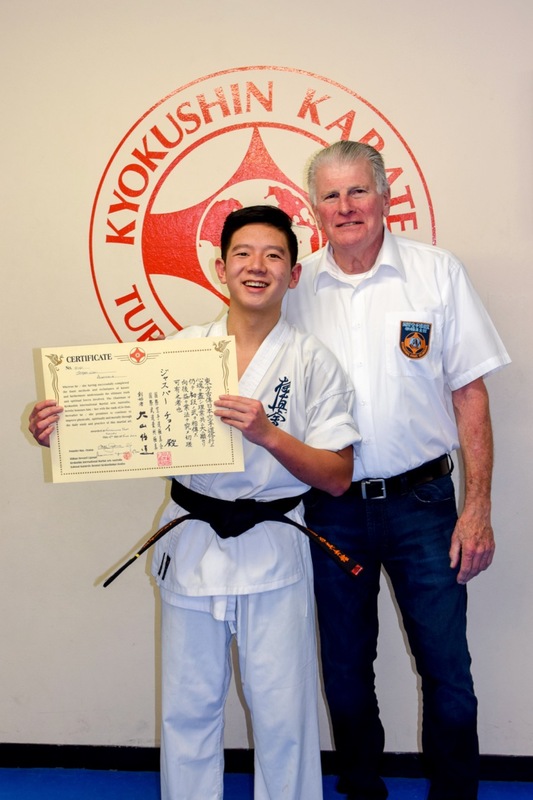 Jasper Choi was promoted to Shodan having started training as a seven year old, and reaching Shodan at seventeen years – the same year in which he is doing his HSC. 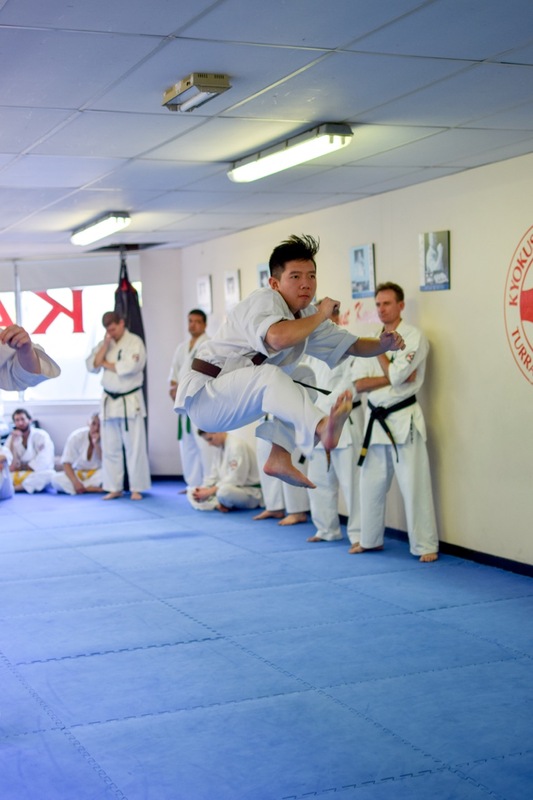 Jasper exhibited an extremely mature attitude towards his training and grading, and general understanding of Kyokushin. He won the respect of all the other black belts and now takes his place amongst them. An essay written by Sempai Jasper Choi for his Shodan Grading (June 2018). Growing up with the martial arts, notably Kyokushin Karate, has been an experience and a test of perseverance, endurance and strength in “mind, body and spirit”, a recitation spoken and lived by its founder, Sosai Mas Oyama. Sempai Jasper Choi during his Shodan grading. The personal development of physical and mental growth from childhood to adulthood is ultimately a journey. A journey which is different for each and every person. Personally, growing up has been the act of fostering an understanding of the world through one’s parents, peers and experiences. Kyokushin Karate has been a core experience that has resonated with and intertwined itself within my life as a karateka and as a person. 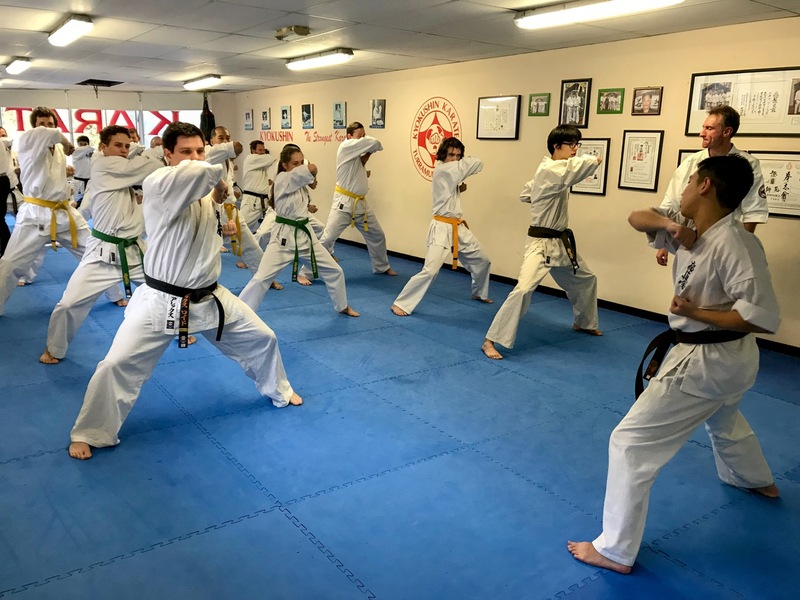 Kyokushin Karate is known and propagated as “The Ultimate Truth” which I interpret as – trust in yourself and others, notably the trust in yourself is what cultivates personal strength and character. This strength of character and trust is imperative to oneself and their aspirations in life. This is the ultimate truth which is the central element of Kyokushin, not only as a martial art, but as a lifestyle. The physical tests of endurance serve to enhance the appreciation and development of key values presented by parental guidance and personal experience. Wesley Snider vs Jasper Choi, during Wesley’s 1st Kyu grading and Jasper’s Shodan grading. From the age of seven, to the age of seventeen, my journey with Kyokushin Karate has not been one of perfection or talented prodigy, but one of challenge and doubt. The grade of Shodan represents only the beginning of a lifelong pursuit, a cliché that all karateka come to agree upon. 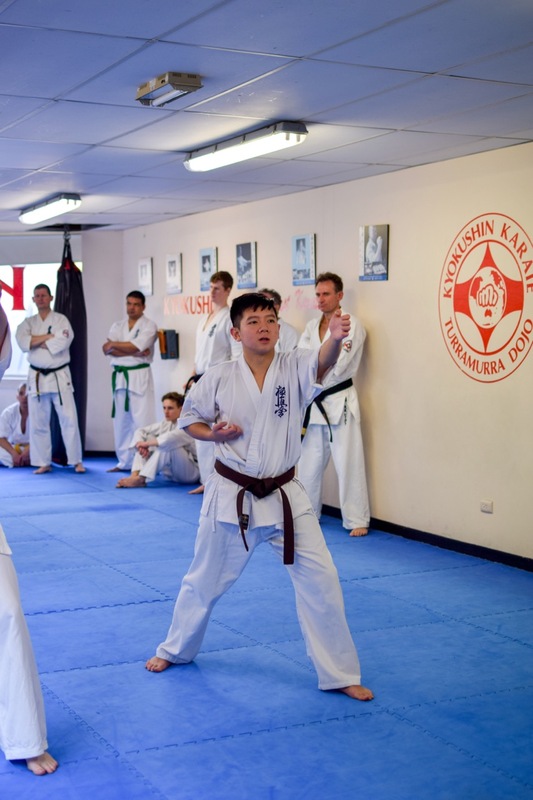 I hope to express within this piece, the maturity and the personal challenges I faced on the path to attain the opportunity to grade to Shodan and the reasons for my readiness to take this next step on my journey with Kyokushin Karate. At the age of seven, I walked up the narrow stairs to the dojo, experiencing for the first time, the now familiar smell of the mats and the spirit of the “kiai”. The sight and the sound of the snapping white gi, the smiles on the faces of the children and the friendship they all shared seemed to ignite the already emerging fire of excitement. Sempai Jasper (right) during his Shodan grading. It was at this moment, I realised, that the gi pants would always be infinitely larger than the gi jacket itself and the belt always tied incorrectly unless done by a professional, either Sensei James or my father. I distinctly remember one of my first instructors, Gavin. I started with two other children, themselves already good friends, disinterested in the movements of the basics. Gavin took me aside, and taught me the beginnings of the first punching basics, ever patient with my lack of coordination. I returned each Monday, Wednesday and Friday after that, with a certain interest that could be compared to religious devotion and fervor. Sempai Jasper during his Shodan grading. This beginning saw the emergence of friendships that grew beyond school, beyond family and beyond other sports. The games played before and after class, the precise movements of kata and the Japanese spirit of respect and humility was reflected in the way I carried myself in the dojo, albeit with small steps and a soprano voice, with a sense of pride and passion for Kyokushin Karate. I now realize, that this sense of pride and passion was formed from discipline as well as friendship and camaraderie. The concept of discipline for a child, something I have also come to realize as an instructor, is at times, confusing and unattainable. My instructors Hanshi Howard Lipman and Sensei James Sidwell made this concept of discipline seem like an enjoyable experience, something I can only hope to emulate and build on as a student and as a teacher. Their patience and their value as a mentor as well as an instructor was appreciated, even by a seven-year-old boy. Sempai Jasper blocks a kick from Sempai Angus Sweeney during his forty fights for Shodan. My interest in Kyokushin Karate as a child did not come without its frustrations and inherent challenges. The dipping motivation and the growing disinterest in the monotony of classes saw my passion for karate wane and fade. The starting of high school brought its own opportunities and challenges. 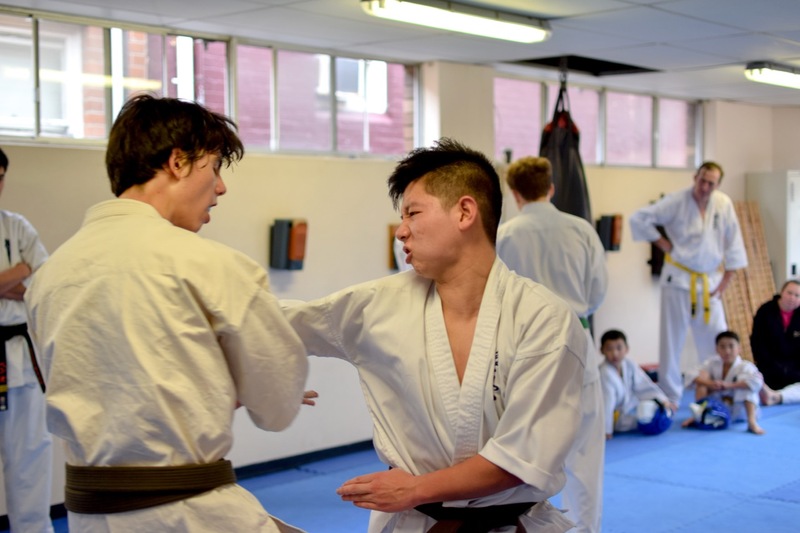 The pressures of academia and personal goals in school sport came to overtake the values I had been taught in the art of Kyokushin. This period saw my attitude become irritable and unpleasant, often resulting in snide comments and excessive pride. I was lost in the world of the teenage boy, apathetic and cynical in my lack of experience. The transition to the adults class became a way of reinvigorating my passion for the martial arts. The passion of that seven-year-old boy came to the forefront once more. 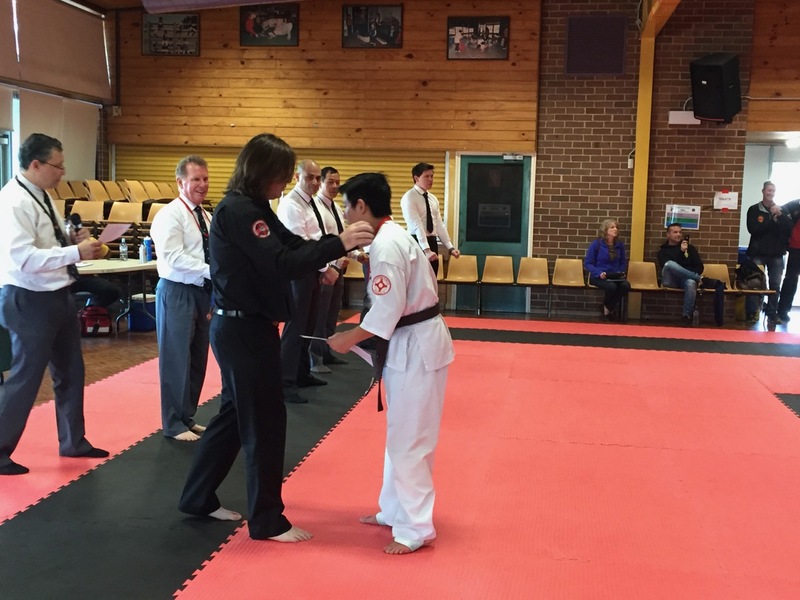 Shihan Glen Gibbons awards Jasper Choi his medal. Jasper came Third in his division at the IFKKA May 2017 Tournament. School debating on Friday nights was another adversity I had to overcome in order to focus on my training. The Friday nights I spent at karate soon became limited and soon stopped. The midweek classes impacted my academic results in Years 8 and 9, ending in sporadic appearances at the dojo every fortnight. The re-emergence of the “ultimate truth” into my young life did not come as an epiphany or a moment of spiritual clarity. It was a moment of humility. I had finally understood the concept that one is never the best, and can never be the best, but only to keep striving for the best. The reality of my situation was that I became disillusioned by everyone else’s success in the dojo and their immense improvements across the months of my absence. People who began their journey after me were training harder than I was, and it dramatically changed my attitude towards my own progress. The healthy competition and support within the dojo drove me once again to strive for improvement and personal development. 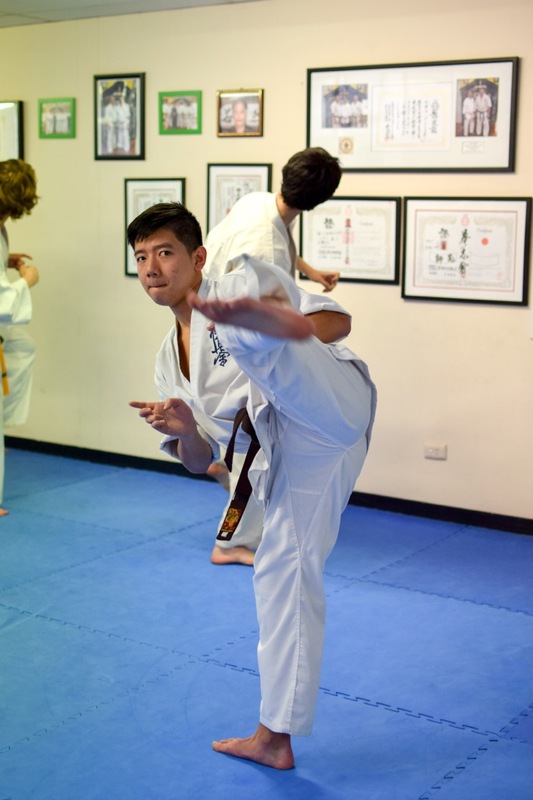 I did not appreciate or know at the time, but the re-immersing of my body and spirit into karate brought a more level headed demeanor towards school activities and relationships with teachers, friends and strangers. This step to becoming a Shodan will represent the change and clarity through the maturity that I have developed since my younger, more turbulent self. As I came to learn the values of humility, respect and moderating pride, my motivation to train hard returned tenfold. I believe that motivation fluctuates, it comes and goes with one’s personal interests and situations, a fleeting emotion, guided by the mind’s perception of pain versus gain. I have come to realise in the most basic sense, that discipline and determination is a hard-cut decision, a commitment and a pursuit of the betterment of one’s own spirit. To truly put into practice, the concept of enhancing the abilities of mind, body and soul. This newfound resolve I have found in my training has been the result of perseverance and determination through discipline. The road to my grading has always been shaded with an aura of doubt and uncertainty, which pervades the whole concept attaining the rank of Shodan, with the building of a strong mindset of determination above the underlying thoughts of failure and giving up. Sempai Jasper after his 40 fights for Shodan. Giving up is always the easier option. Giving up is the unconscious whisper that tells you to put down the weights, to stop moving your legs, to walk away from the heavy bag. Giving up only leads to failure and no improvement. My personal understanding of this painfully tempting option, is that giving up is beautifully masked by the excuses and cynicism that comes with failing a task. To undertake the training needed to attain the grade of Shodan, the mind must be strong in resisting the ever-present urge to stop and rest and the body must be strong to resist pain and fatigue. I present this statement to highlight the fact that my mind is not of the strongest will, and my body is not conditioned to the point of whole readiness. It is a constant challenge that only determination can drive, not motivation or fleeting interests. I believe that this ongoing commitment is what has made me ready to attempt the grading with a strong and ready resolve. This commitment has returned to me since the end of Year 10, beginning my journey as a teacher as well as a student. This has been the most invaluable experience since my return to serious training. 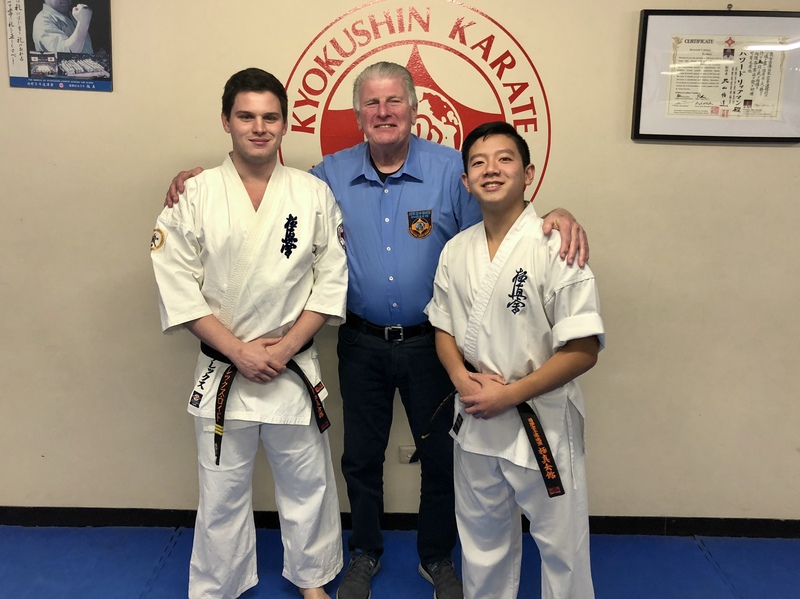 The experience of teaching has truly widened my perspective as a student of Kyokushin Karate and brought a newfound respect for my instructors. This value of respect has been instilled in me not only by my teachers, but my friends, children and the parents who involve themselves with KIMAA. I came to experience that teaching is not the exercise of feeling superior or talented. It is the emotion of humility that drives the process of helping one enjoy and find passion for Kyokushin Karate. With my limited years of teaching Kyokushin Karate, there are some questions which never fail to reveal themselves in a conversation with parents hoping to send their children into the supposed “abyss” of the martial arts and its connotations to violence and unruliness. 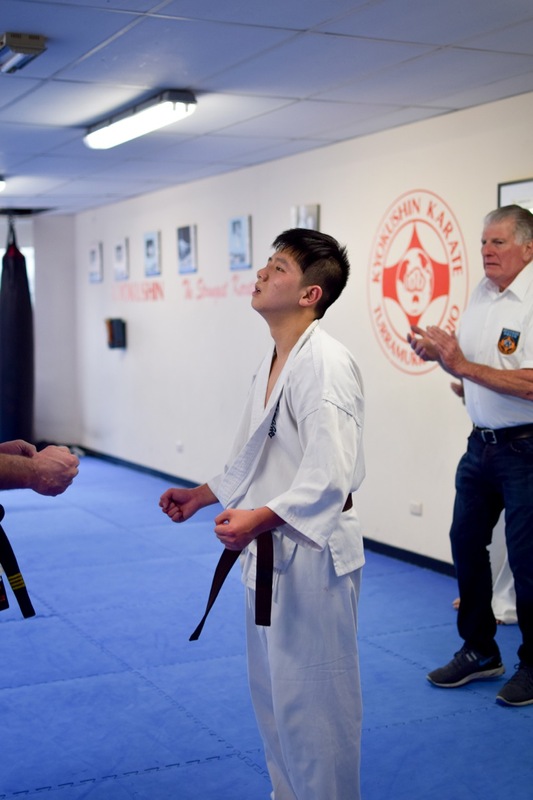 I find that there are generally two types of parents when it comes to sending their child to train at the dojo. One believes that it is ‘too hard’, violent and generally unnecessary and outdated with what is going on with the ever advancing world of technology. In contrast, the other parent believes in the disciplinary and cultural connections to the art of Karate and its ability to strengthen mental willpower and physical ability. I believe that karate is a combination of both perspectives. I tell parents and peers alike: karate is hard, it is a lifestyle that encompasses aspects of sport and fitness. I express that karate is hard not only because of its physical demands, but the mental demand. Through teaching, I have realized that this mental strain is the hardest part of Shodan training. The common question that my brain screams during personal training in the gym or at the oval is “Do I finish the last 10 pushups of this set? Do I run that extra lap? Or do I have a warm shower and go home?”. This question is integral to success in striving for a Kyokushin Black Belt, but what is more important is how one answers that question. 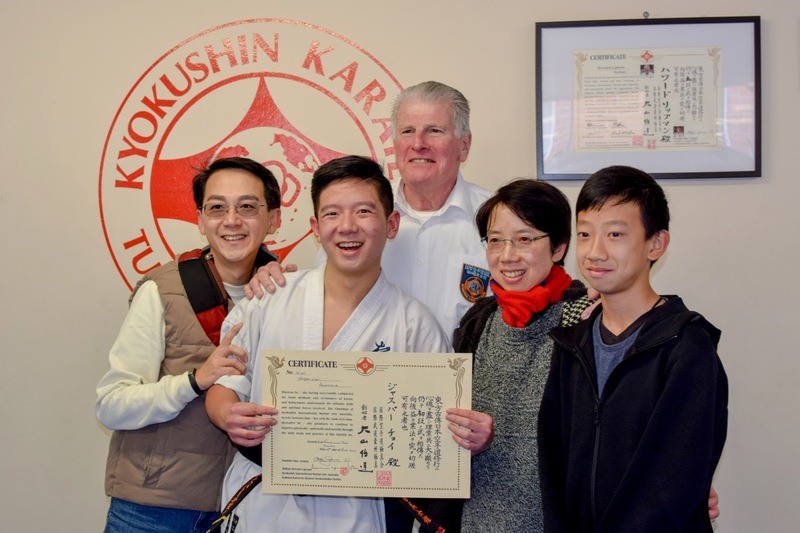 Sempai Jasper with his family and Hanshi Howard, after being awarded his Shodan. Before I taught classes, I would arrive early to work the bags and practice kata, to the dismay of many of the children due to the interruption of their games. I would practice my own kumite drills with my young students, with the surreal answer of “Osu Sempai” echoing from a group of soprano voices. The infinite respect I have for the kids, they will only understand when they grow older, to walk the same path as I did, hopefully facing their own personal challenges with even more resolve than I had. The power of a child fills me with awe and wonder at my own temperament as a young boy. They are all bursting cauldrons of energy until the call for pushups rings across the mats of the dojo. As I see it, the child possesses a malleability that resembles that of wet clay, its properties easily able to become distorted and unfocussed, or sharp and polished with the exact same ease. I hope to learn the skill and effortless connection and friendly tutelage afforded to me by my instructors and to reflect it within my own teaching. 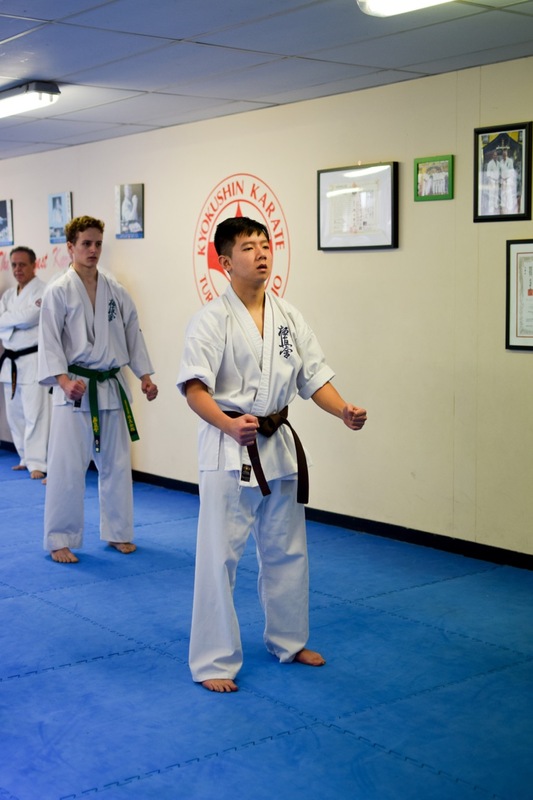 Thus, idea of the growth and development of a child through the martial arts has not only affected my life, but has enabled me to share my passion and spirit with others, to foster their desire and determination as well as their techniques and kata. One aspect of the Shodan grading I have observed, is that one is never totally ready. There will always be improvements to be made. There will always be someone to learn from, and there will always be something to aspire to. 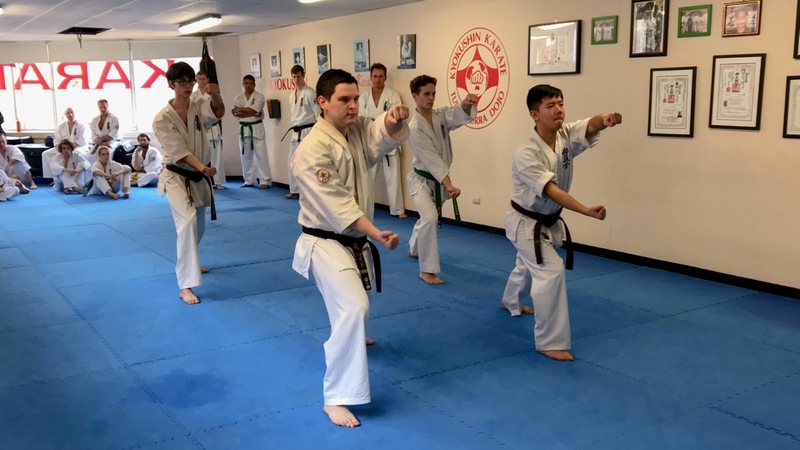 Sempai Jasper leads the class during his Shodan grading. The lead up to this vital step, or leap, of my journey as a karateka is one I will always remember. The hours of training, culminating into one grueling day, pushing one’s limits and overcoming the pain to achieve not only a physical reminder in the form of a belt, but a symbolic representation of my hard work in proving myself to be faithful to the “Ultimate Truth”. 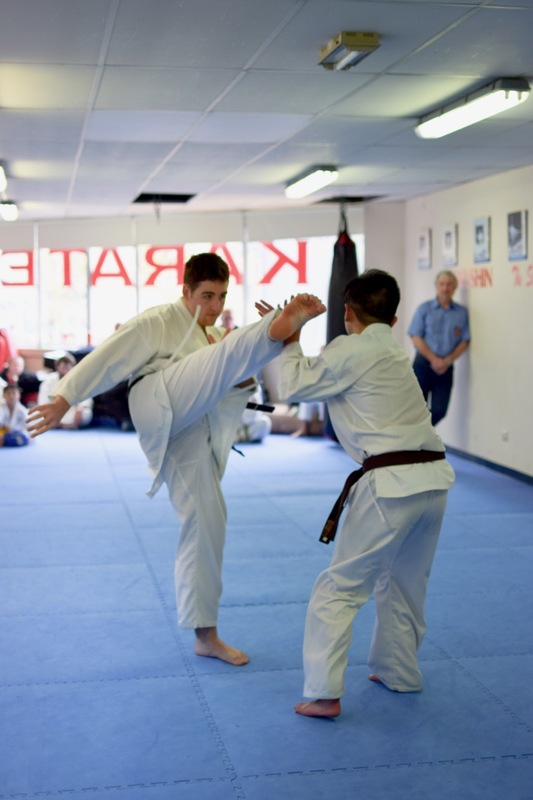 My development from that seven-year-old boy has seen the overcoming of hardships and adversity and a newfound understanding of the values that drive the Kyokushin Spirit. My appreciation of humility as well as strength and pride has been central to my improvement as a karateka, student and teacher. My aspirations are to continue learning from my instructors and peers, and to continue guiding younger karateka to achieve their best inside and out of the dojo, whilst remembering my own journey and forging new paths to success through this next step of my development in growing up with the martial arts.